Fernando Alda’s photographs clearly reveal the strong contrast between the deep, luxuriant green of Chile’s mountain landscape and the little red house designed by Felipe Assadi Arquitectos. Felipe Assadi Arquitectos designed a little house on two floors surrounded by the luxuriant green landscape of the San José de Maipo mountains in Cordillera province in the metropolitan region of Santiago in Chile. 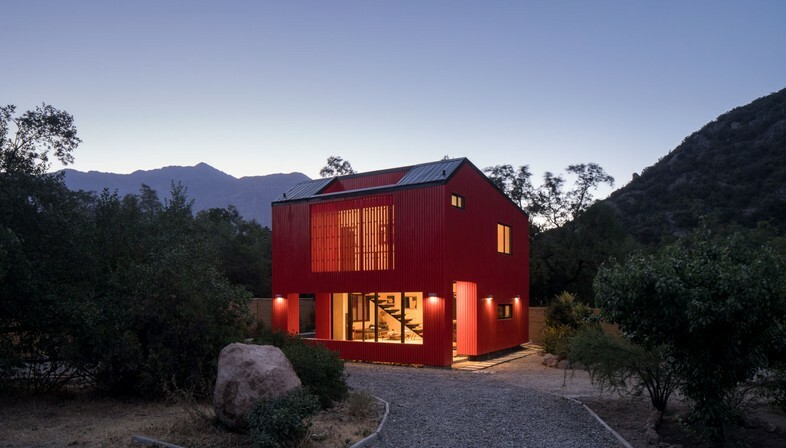 In La Casa Roja, named after its bright red exterior, the architects adopted a “simple” solution to give a small house a lot of character and make it stand out as instantly visible in the green landscape of the area. 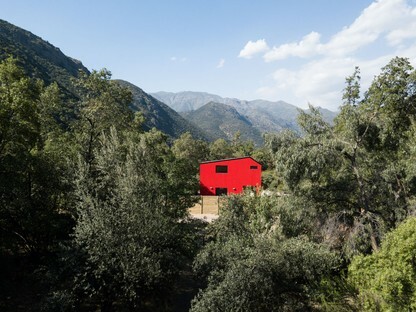 Fernando Alda’s photographs clearly reveal the strong contrast between the deep, luxuriant green of the trees of Chile’s mountains and the bright red of the little house designed by architects Felipe Assadi, Trinidad Schönthaler and Macarena Ávila of Felipe Assadi Arquitectos. By underlining the house’s detachment from nature and making it look like an object placed on the land, the architects focused attention on the way the house is connected with the ground. 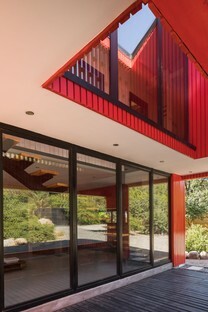 The flame-red walls seem to be lifted above the soil by a system consisting of gravel, concrete and wood marking the point of mediation between the natural terrain and the floor level in the house. The effect of contrasts and opposites is reinforced by the little building’s bold materiality. The architects impose the simple geometry of a solid volume, a red cube, on an apparently “disorderly” natural landscape. The house looks like a “solid” volume from which the architects have skilfully subtracted material to create windows, verandas, a patio that becomes an entrance hall of double height, the slopes of the roof, etc. Emphasising the building’s presence with a strong, uncompromising colour like red that cannot hide among the greenery of the vegetation was an intentional choice, for the home is located in a mountainous rural area with little urban development and a very low construction density. Each house has an average of 5000 sqm of land around it, and there is no visual contact with other houses: all good reasons to create a “strong object” that declares its presence and becomes a landmark in the area. To these considerations, we may add that red is quite a common colour in the constructions in the town nearby, making the building easily recognisable as “a house”. La casa Roja was built directly on site, but the architects designed it to permit prefabrication of its component elements. Each floor is made up of two modules, a total of four elements that could be built in the factory and the transported to the site individually on trucks. The project’s modularity and symmetry is part of the architects’ carefully thought-out programme permitting future extension of the home by adding new modules to the sides, below or above it, connected via the corridor by the central staircase. The game of contrasts continues on the inside, where the bold colours of the façade contrast with the softer colours of natural stone and wood in the minimalist furnishings.